Outfront Media wants to construct a massive digital billboard in the residential community of Leaside. The problem is, no one wants digital billboards in their neighbourhood, for obvious reasons, so companies like Outfront have to find creative ways to build community support. After all, digital billboards are not legally allowed near homes which means that Outfront needs to apply for a special exemption from the sign bylaw — and that requires some support from local residents. So here’s what they did. They offered the community $40,000. Annually. Simple as that. 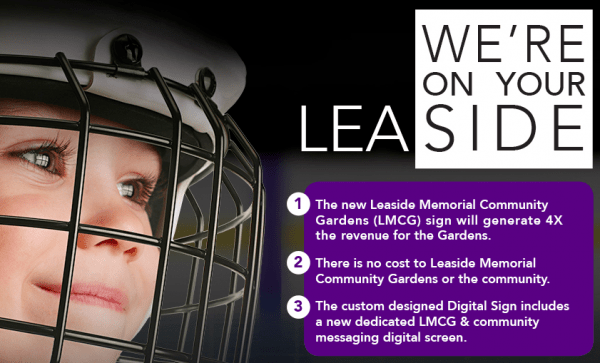 The proposed billboard would replace an existing smaller static paper billboard on the property of the Leaside Memorial Gardens Arena. Outfront has offered to increase their billboard rent by $40,000, contingent upon securing an exemption from the sign bylaw. According to the lobbyist registry, representatives of Outfront discussed this proposal with the local councillor twenty six times. They also met with each and every member of the arena’s Board of Management (details here). The other misleading detail is about the impact of the savings. Hockey parents have been told that “A $40,000 increase in revenue equates to a reduction of ice rates of over $11.00 per hour in prime time.” That sounds significant, until you think about the fact that each hockey team has between 12 to 16 kids, and there are two teams. With 24 to 32 families splitting the cost of each rental, through their league fees, the savings is actually less than 45 cents per hour, per family. None of the public outreach materials informed residents that the new proposed sign would be much larger, higher, and brighter than the existing paper sign, and would contain digital advertisements flashing 5,000 times each day. Outfront has successfully convinced the local Councillor, the arena board, and the hockey parents. A hat trick. But their game strategy was misleading, delivering a body check to an entire neighbourhood. The intent of this policy is to prevent companies like Outfront from using their financial resources to influence public opinion, by offering monetary favours in exchange for public policies that benefit the company. In the case of the Leaside billboard, it seems that this policy was repeatedly ignored by the lobbyists, by the councillors involved, and by the arena’s Board of Management. Toronto’s residents should have control over their own neighbourhoods. That means that important decisions about how we use our public spaces need to happen in a fair and transparent manner, with citizens being fully informed about the issue and without any improper influence from private companies who offer cash in exchange for political favours. Last week I filed three complaints to the Office of the Integrity Commissioner regarding this proposal. City Council has the option now of approving the billboard application later this week. Or they can do the right thing, and defer this item until the Integrity Commissioner has had time to review the complaints and investigate whether or not any rules were broken.